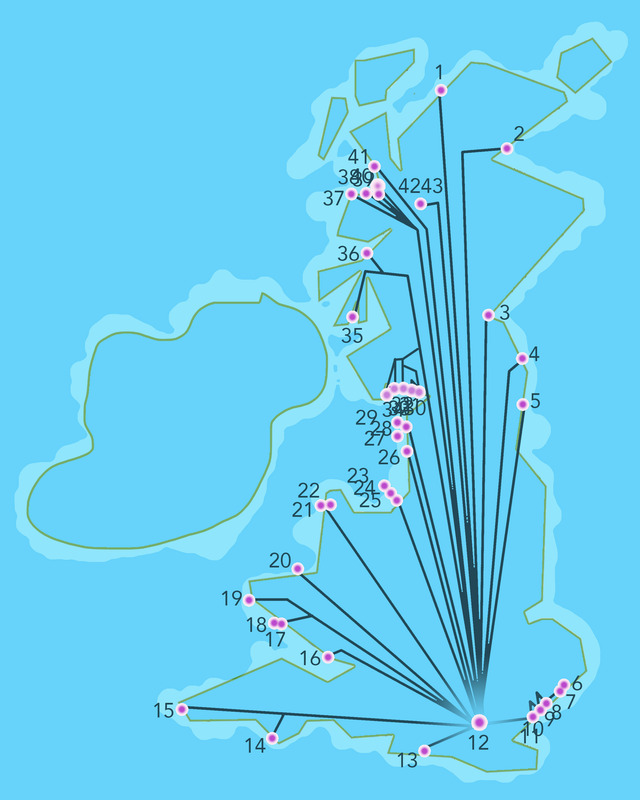 Location: 43 tidal islands around the coast of the UK. He does not believe in the disaster. One cannot believe in it, whether one lives or dies. Commensurate with it there is no faith, and at the same time a sort of disinterest, detached from the disaster. Night; white, sleepless night-such is the disaster: the night lacking darkness, but brightened by no light. The circle, uncurled along a straight line rigorously prolonged, reforms a circle eternally bereft of a center. “False” unity, the simulacrum of unity, compromises it better than any direct challenge, which, in any case, is impossible. Would writing be to become, in the book, legible for everyone, and indecipherable for oneself ? From larger to the smaller islands is a durational cross-country walking project that will circumnavigate all 43 of the UK’s tidal islands. The work is cross ethnic, cross generation, and gender, involving two artists, one a UK native, the other an artist whose status in the UK is temporary. Documentation confronts the contemporary witness report, contrasting a live video stream with a temporal record that employs the convections of classical music notation. Tidal islands are areas of land that are connected to mainland only at low tide when a causeway rises above sea level. For the purpose of this project to qualify the islands must be accessible at least twice a month. The British Isles has the largest number of tidal islands of any nation. In this work the island is conceived as intrinsically separate and multiple but with the potential to be one. In a very few instances the Islands, for reasons of intransigent private ownership, or, because their coastal terrains are too inhospitable to be walked, will be circumnavigated by boat. The contingency highlights the intention of the project, to address leaving and returning and to evolve ways of representing the practice of migration. From larger to the smaller islands evolves from a body of work where artists make journeys with heroic and endurance elements, particularly where movements are impractical or flawed, either returning to their place of departure or ending in indeterminacy. Such endpoints and defenceless crossings are the trajectory of migration. Refugees flee; they leave their homes, not knowing where they can go and if they will ever return. The project repeatedly exposes the artists to the potential of danger and separation as they make crossings that are repeatedly obliterated. There are necessary orders that are no fault of yours and there is a bridge and that bridge can be the point on which the future of the human race can turn. —Ernest Hemmingway, For Whom the Bell Tolls, Macmillan Collector’s Library 2016, p.25. The flight of the experimental solar powered aeroplane, ‘Solar Impulse 2’ suggested a decelerated momentum of circumnavigation. The aircraft departed Abu Dhabi on March 9th 2015 and returned more than 16 months later on July 26th 2016. In that period the plane had many short flights and long rests, using the sun’s energy to recharge. Impractical and erratic the voyage belonged to a tradition of first gestures, including Jules Henri Giffard’s 1852 demonstration that navigable powered flight was conceivable. Possibilities emerge from unpredictability and achievement can mean returning to where you set off rather than being somewhere else. Tidal islands are dependent on irrepressible change. Despite cyclical predictability incoming water is a threat that detaches and connects. The routes of the 43 circumnavigations that make up the project define their localities, following the perimeter of the island from point of arrival and back to the same place. Contained at the perimeter, the work is non-invasive, the integrity of the land described remains undisturbed. The incoming and receding tide relates to the artist’s arrival and departure. Repeated oscillation and the artist’s tenacity, prevailing over awkward difficulties, are intimations of hope—that there will be a future of reconnection and unity. Work, Made-ready, Les Baux de Provence (Mountain Bike) 2001 Simon Starling’s journey by mountain bike to collect bauxite that he then smelted using simplified industrial techniques to produce a quantity of aluminium that he then used to attempt to recreate the aluminium frame of the ‘Tassajara’ mountain bike that he had ridden to the mine. Cane, 2012 Loo Zihan’s repeated re-enactments, based on oral recollection and press reports, of Josef Ng’s performance work Brother Cane (1993). La Région Central 1971 Michael Snow’s structural movie, abstracting the landscape by rotating the camera in a 360˚ pan from fixed at a center. In a world where exodus and displacement have become a constant the project will address unintentional transit, asking the question; must ‘somewhere’ be fixed and does a journey end? —Peggy Phelan, Unmarked: The Politics of Performance, Routledge 1993, p.146. Recent documentaries, such as ‘Exodus: Our Journey’ (James Bluemel 2017) and ‘Les Sauteurs (Those Who Jump)’ (Moritz Siebert, Estephan Wagner and Abou Bakar Sidibe 2016), endeavor to express the exigent humanity of contemporary migration by handing the camera over to people living in transit and actively engaged in negotiating a passage from their original homes into Europe. The first person viewpoint and extended informal footage, shot in real time, challenges the supremacy of the decisive moment of still photography as record of a poignant truth. The score: a processed distillation of the experience, an enduring non-representational transcript in a robust physical form for further performance. The score is a portable memento, comparable to a portable codex. The live stream: an undigested total record, in this case two points of view from the feeds of body mounted action cameras shared through Facebook Live, Youtube live-streaming and the China based Youku cloud video. The broadcast is ephemeral, long-winded and episodic: witnesses to the total extended duration of the project resisting the edited spectacle of documentary. The live archive of two viewpoints is exhaustive. It cannot easily be revisited or assimilated as a unity. The inscribed score is reflective, a prompt to future performance, deferring the journey’s end. The evidence is a corollary to the act of travel without going anywhere, arriving at the point of departure in a repeated cycle. The project’s documentation eschews the portrayal of singular biographic incidents being reactive to the spectacle of mass migration as continuous, changing and future directed. The project exists as an on-going action until all 42 islands have been visited. Although extensive in scope it is not monumental. It is only encountered via the Internet or through occasional unpredictable field encounters and, as legacy, in the structured score. The series of walking performances take places at locations with varying degrees of accessibility, both for performers and for any imagined witness. Some are popular tourist sites, some challenging to navigate or with restricted access. The record and dissemination strategy will explore the accuracy of a full and a mediated account, a literal and a poetic trace. Both records are temporal but without topographic or cartographic specificity. Be not afraid, though you do see me weaponed. 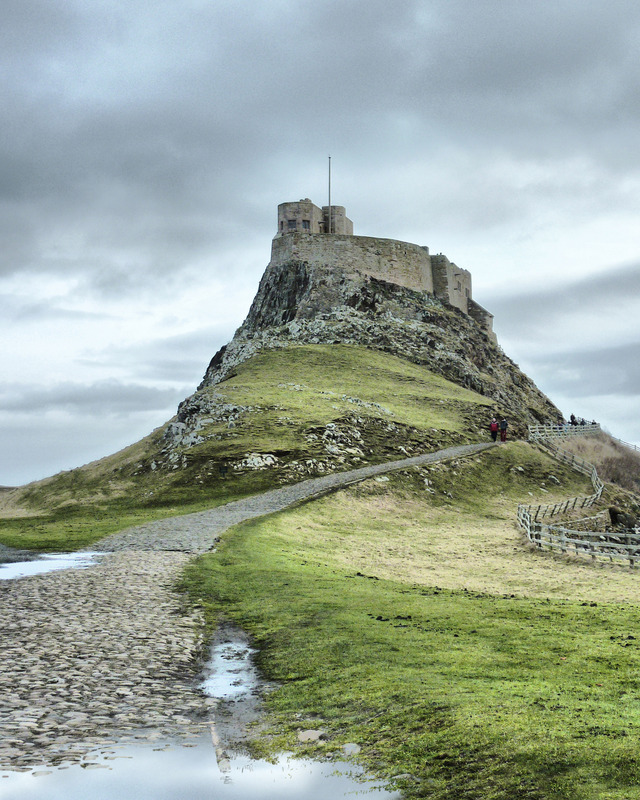 The project grows from a twenty-one day walk from London to the tidal island of Lindisfarne. 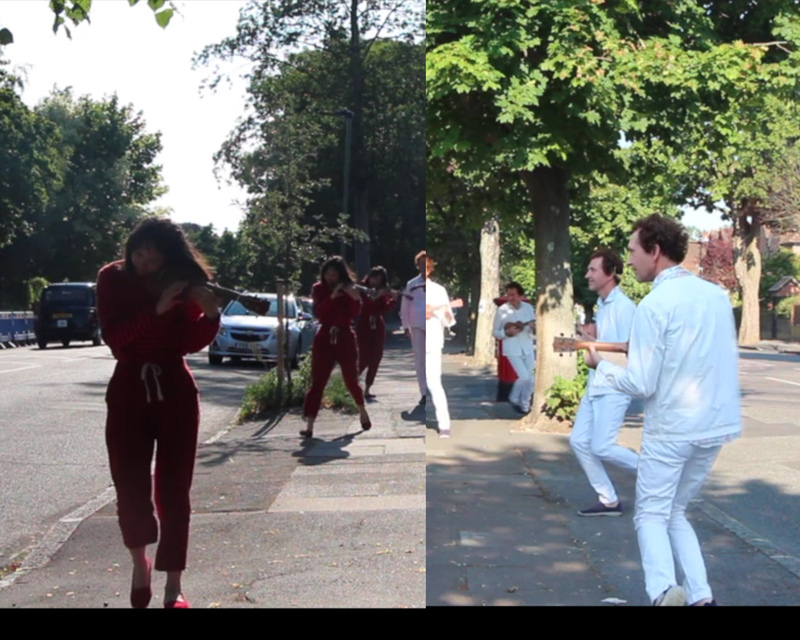 The walk was undertaken by a Chinese woman and a European man, the act differing the subjectivities of two, proposing a crossover, both literal and metaphoric. The work evokes circadian rhythms, causing interference patterns, gradually tuned to establish singularity, just as mainland is separated from peninsula and becomes one through the rhythm of the tides. The invention of modern musical notation by Guido di Arezzo corresponds to the resettlement of Lindisfarne as a religious community, following a period when monastic orders were forced into a peripatetic lifestyle after the Viking aggression in 793. The means to preserve a portable archive, of material hitherto disseminated person to person, was an answer to sporadic unplanned displacement. The score is simultaneously an exact set of instructions and a free script open for new interpretation. The circular Mappa Mundi is an ideological representation of the world. Later cartography had the ambition to make a diagram of the earth according to physical measurements. Earlier images showed not physical extent but the organisation and the limits of knowledge. The circular form did not correspond to the opinion that the earth was round but stated that all exploration started in the centre. All journeys would reach an end, an end of what is and can be known. In 1942 Marcel Duchamp produced His Twine for the ‘First Papers of Surrealism’ exhibition in New York. Duchamp threaded an indeterminate length of string (it is claimed to be a mile) around the exhibition space making it difficult to enter and view the other works. He also instructed 12 children to play ball and hopscotch around the exhibition, further incapacitating visitors. The exhibition itself set the work of émigré surrealist artists against examples of ‘primitive art’. It equated the work of the artists, lately displaced from Europe, with the exotic work from outside the legitimate Western cannon. Duchamp’s intervention created a physical inaccessibility, smothering the works and binding them with distraction. Bruce Nauman withdrew to the ordered space of the studio to perform, Walking in an Exaggerated Manner Around the Perimeter of a Square (1967-8). The path, witnessed on the video document of his action, takes him nowhere. The manner of the walks execution and the charged site of its performance, intended to be presented on an endless loop, challenge the model of purpose, the getting from A to B.
Richard Long’s A Hundred Mile Walk (1971-2) echoes Nauman’s gesture in a landscape. Long’s document of his route traces the work’s extremity with a closed circle inscribed on a map. The precise form appears contrary to the seething contour lines of Dartmoor. The representation evokes the experience in the mind of the spectator while simultaneously denying access to its experiential authenticity. In Bas Jan Adder’s Fall II (1970) the possible trajectory of the journey is cut short. The artist stages an abrupt end to the potential for forward movement by riding his bicycle into a cannel. The event, recorded in the filmed document of the action, foregrounds the incidence of a movement that is vulnerable to changed circumstances, diversions and sudden end. Just such unpredictability beset his final fatal work. In Search of the Miraculous 1975 ended in the artist’s disappearance at sea as he attempted to cross the Atlantic. Rebecca Moss’ International Waters (2017) is an account of her experience on the container ship ‘Hanjin Geneva’. She joined the vessel for a 23 days residency but was left stranded indefinitely, drifting off the coast of Japan, when the shipping company went bankrupt. The journey’s end point shifts from its original directed conclusion. It takes her nowhere—to indeterminacy, to waiting. Against the current background of President Trump’s border policies, Francis Alÿs, Loop (1997) seems prescient. The work was a journey from Tijuana to San Diego avoiding crossing the Mexico/US border. Alÿs traveled on a perpendicular route eventually circumnavigating the globe to arrive at the other side of the frontier. Many works, such as Zheng Bo’s, Left Right (106 Rue Wantz) (2015) and Li Ming’s, Movements (2014) build on the spatial record initiated in Edward Ruscha’s, Every Building on the Sunset Strip (1966). Like the alluring grid markings that act as both temporal and spatial markers in Eadweard Muybridge’s Animal Locomotion (1887), the linear horizontal orientation of Ruscha’s work is absolutely literal. 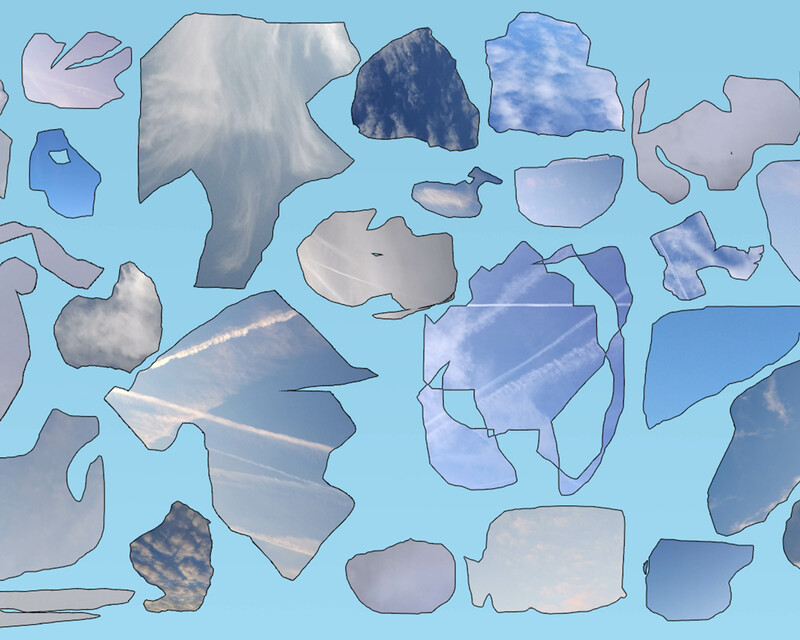 It distorts the experience of space by subjecting it to a rigid system. Alex Hartley’s Nowhereisland (2012) was a locomotive and prophetic landform that invited the participation of a new citizenship. The premise of the work was if a nation was born new and without prior historical preconceptions what could it be? Could its citizenship make it an ideal state? Physically the work was a stretch of land exposed by receding sea levels. The exposed material was subsequently transported by ship to various costal locations. Pieces were finally distributed to its citizens, and a remnant was also sent into earth orbit. Robert Smithson’s Spiral Jetty (1970) at Rozel Point, Utah, remains an enigmatic piece of Land Art. Despite its physicality it lives in the imagination. Now once more visible, for many years it was submerged, swallowed beneath the saline water of the Great Salt Lake. From larger to the smaller islands, draws on the character of existing geography and on natural cycles and phases. The project considers ways of thinking about leaving and belonging—returning and a new land. Its archive of experiences and its record is fugitive too. A record that is continuous, changing and open to adaptation, in harmony with the will to find ways to cherish and new possibilities for states in unsettled times. Please check back with Project Anywhere to follow the progress of this project.